salt and other contaminants from water and other fluids.For more information please visit at "pressurejet" website. The most efficient reverse osmosis systems utilize high pressure to purify large volumes of water. On large marine vessels and in remote areas of the world, much of the water comes directly from the ocean. With no cups, packings or seals, the PressureJet high pressure reciprocating plunger pump is ideally suited to deliver smooth, high pressure sea water to the separation membranes of the reverse osmosis unit. In the world of RO-desalination, the high pressure triplex plunger pump is an essential component and must be designed to handle these treacherous conditions. In this reverse osmosis and desalination systems, high pressure plunger pump circulates the water, leaving extremely pure water, which is ideal potable water aboard yachts and ships away from the water molecules and expel clear water. 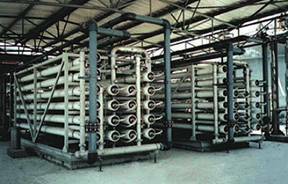 The significance of reverse osmosis over other methods for separation problems is a low energy requirement. The only energy needed is the pressure to force the fluid through the semi- permeable membrane. This is provided by a high pressure pump driven by electric motor or engine. High pressure pump provides a smooth quiet continuous fluid delivery in offshore reverse osmosis (RO) installations and desalination systems. PressureJet is a major supplier of corrosion resistant, stainless steel pumps for high pressure, seawater desalination, and reverse osmosis systems. Our complete line of SS 316, SS316L and Duplex Stainless Steel desalination pumps offer corrosion resistance, strength and long life, when pumping sea water under high pressure. We have many desalination pumps operating in systems on large ships, offshore platforms, island support and remote locations. The ceramic plungers used in these pumps have surface roughness value less than 0.25 Ra, which gives longer operation life to plungers and seals. PressureJet offers low speed pumps, which give almost vibration and pulsation free performance. The material of construction can be SS 316, SS 316L, duplex stainless steel, nickel bronze etc., as per customer's specific requirement. These specially designed pumps are of high quality, very efficient, power efficient, reliable, compact and requires very low maintenance. Pressure Jet has supplied many high pressure pumps for reverse osmosis application all over India as well as in many countries like South Africa, Mexico, Brazil, Malaysia, Philippines, Thailand, Turkey, Indonesia, Bangladesh, Nigeria, Vietnam, Egypt, Iran, Israel, South Korea, Spain, Colombia, Argentina, Kenya, Algeria, Canada, Morocco, Uganda, Ghana.